When we talk about data migration we should know how crucial the subject it. A failure in perfect work could be catastrophic for any organization. System integration is also a major part of the process. There are significant changes and upgrades expected out of a perfect system integration & data migration operation. Migration and integration both are actions taken when there is an upgrade available for the technology you’re currently running. Let the experts do the job so that you could gain value out of your expenditure along with no interruption in the smooth running of your business. Robust: Excellent management of data extraction, transformation, cleansing and validation. Resilient: The loading process should not be too long. Issues and adjustments should be easy to make. Rapid: The process of execution should be efficient and should process rapidly. 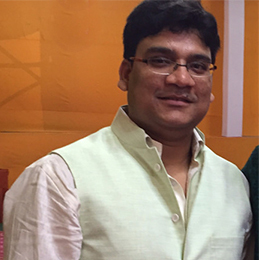 Reporting: Monitoring and reporting related to the progress is highly essential. Reconciliation: This is a major step in the data migration process. Recovery: The data should be recoverable in case of a breakdown during the migration process. Reusable: You should be able to reuse component and migrate other projects when required without hampering the data already migrated. What is a Data Migration Tool? On-Premise Tools: The on-premises tools are designed to migrate the data within a specific network. Open Source Tools: These tools are community-supported and are developed data migration tools. These are available for free or at a really low cost. Cloud-Based Tools: Designed to move data to the cloud from various sources and streams, including on-premise and cloud-based data stores, applications, services, etc. You would need business data diagrams and data flow diagrams. These diagrams would help you in deciding which of the data is of high priority and needs to be transferred first. You would also know which of the data need not be transferred at all in order to avoid unnecessary expenses. Ensure that a two-way check is done. Check for data dumps and fields that are not in the model of your data. One of the important requirements is appropriate fields for your data. Test and retest the scripts and codes. You would need to strategically plan for data testing. The database behind the scene has properties that do not show up in your software, however, they need to be setup correctly for smooth running of the technology after the migration. 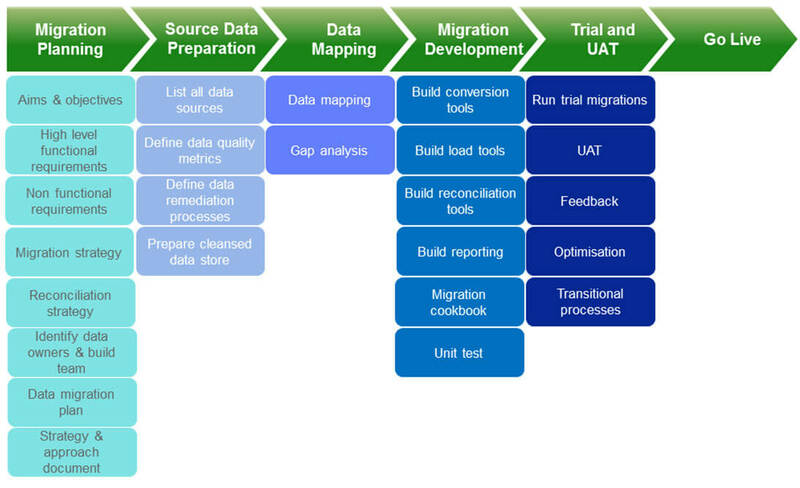 Our process of data integration and migration is defined in the image above. 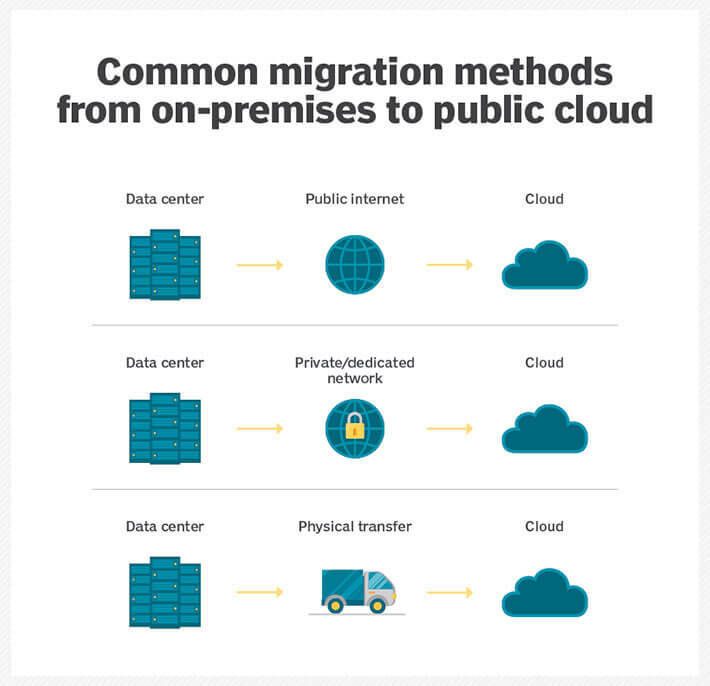 What is Data Migration in Cloud Computing? If you’re a company working on your first cloud migration, you should know that the process involves moving data and apps to an environment where the computing is handled in cloud technology. An enterprise can perform various kinds of cloud migrations, and the moving of data and apps from one cloud to another is also a popular kind of operation. You should also know about reverse cloud migration. It is known as declouding, and in this process your data and apps are moved from cloud computing to a local data center. These offer cloud migration services for private and dedicated networks to perform data transfers and well offline migrations. Some of the challenges that one might face during data migration to cloud computing cloud be related to integrity, security, and profitability. The migration ought to be performed by experts to ensure you have zero failed links, and you can experience the true benefits of the computing system. Should You Migrate from Salesforce Classic to Lightning? Yes, you should. Keeping the rate of upgrades from Classic to Lightning in picture, Salesforce experts can confidently affirm that the days for Salesforce Classic are numbered. The question is do you want to migrate or not? Take for example, you’re a service agent and what your requirements are different from that of a sales agent. In this scenario what you need to do is develop different user personas and prioritize the functions for each. Once you have understood which features are essential for your business you would have your the answer to the question above. Users have unique needs just like the service providers do and at Dreamstel, we have taken the initiative to explore the building blocks of Salesforce Lightning. Data integration is a required process when merging two companies or applications for a unified view of the company assets in terms of data. An enterprise’s data warehouse is build for implementation of the data that is integrated. 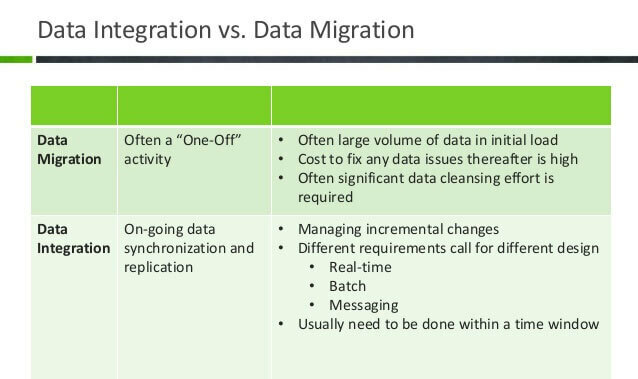 What is the difference between data migration and data integration? Data Migration process of transferring data after transforming it to be compatible for processing when required with the latest trends and technologies. Data integration is the process of combining data of two or more entities for a unified view of all the data in one place. We start with data extraction, data transformation and rapid loading. We standardize the data and upgrade it to work better with the upgraded technology ensuing that the links works perfectly and the information you receive and save is accurate as before. At Dreamstel, we focus greatly on data cleansing. There are three ways to ensure the data cleansing is perfectly performed. The three ways are structure cleansing, critical data cleansing and non-critical data cleansing. The data entries error are corrected during this process, and the level of importance of the data would depend upon how well a company can operate with or without it.